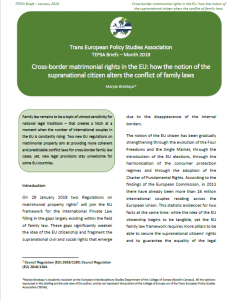 TEPSA is happy to present its new policy brief “Cross-border matrimonial rights in the EU: how the notion of the supranational citizen alters the conflict of family laws” written by Maryia Breskaya (Academic Assistant at the European Interdisciplinary Studies Department in the Natolin Campus of the College of Europe). Family law remains to be a topic of utmost sensitivity for national legal traditions – that creates a hitch at a moment when the number of international couples in the EU is constantly rising. Two new EU regulations on matrimonial property aim at providing more coherent and predictable conflict laws for cross-border family law cases; yet, new legal provisions stay unwelcome for some EU countries.